Super Bowl 51 is over, and preparation for the next game, which is coming to U.S. Bank Stadium next February, has begun. 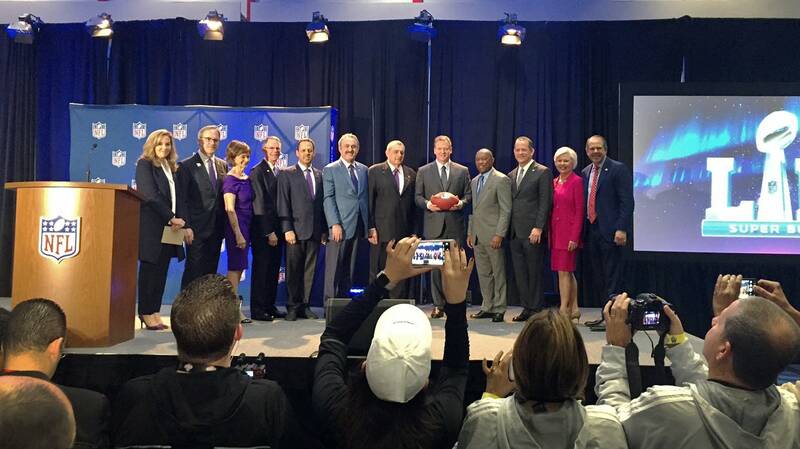 NFL Commissioner Roger Goodell handed over a ceremonial game ball to officials from Minneapolis Monday morning at a kickoff event in Houston, just hours after that city hosted Super Bowl 51. Super Bowl 52 will be the second time the game has come to Minneapolis — the Washington Redskins and the Buffalo Bills played in the Metrodome in 1992. The host committee organizing events around next year's game is starting a 52-week campaign to prepare. The campaign will be marked this week with special light displays in downtown Minneapolis Monday night, as well as countdown clocks on 30 billboards around the Twin Cities. A reception on U.S. Bank Stadium's Downtown East plaza will take place Tuesday afternoon from 2 to 4 p.m., with coffee, ice sculptures and "surprises," according to organizers. Wednesday will mark the official launch of the 52-week charitable campaign, featuring grants to communities around Minnesota, focusing on health and wellness. Friday will feature a rally at the Mall of America rotunda, starting at 5 p.m. The championship was part of the pitch to build a replacement for the Metrodome, bringing in millions in expected economic impact in return for the $498 million taxpayer investment in the new building. U.S. Bank Stadium is scheduled to host the NCAA Men's basketball Final Four in 2019, and may also bid on a future College Football Playoff National Championship.